This cravat is made of a heavily textured needle lace, known as gros point de Venise, which was the most fashionable choice between the 1660s and the 1680s, for both men and women. During this period, extravagant displays of lace were increasingly worn as a mark of wealth and status. 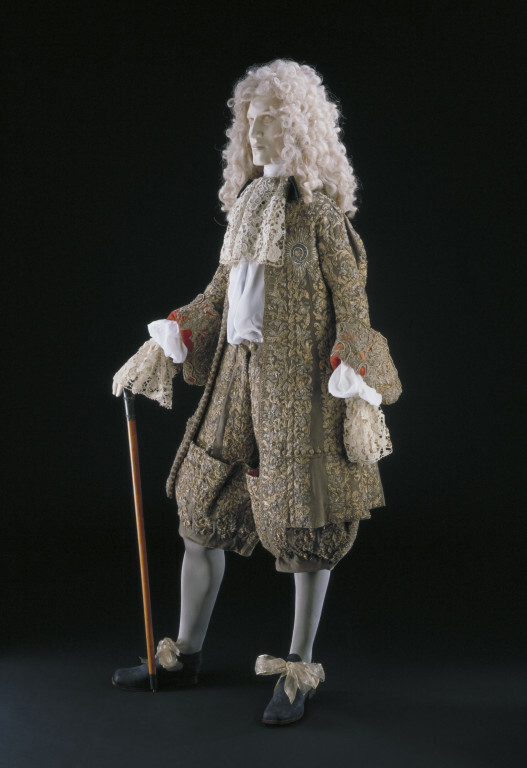 The showiest effects were achieved with lace at the throat and wrist, setting off the face and hands, but a fashionable man might even have matching lace borders trimming his boot hose, or stockings. English travellers often purchased their lace abroad and brought it home. Lace for cravats was available either by length or by the piece, made to shape. It was usually made up by a milliner. Sometimes, at a later stage, it was adapted into a newly fashionable style. In an attempt to protect the English lace industry, a royal proclamation was issued in 1662 forbidding the importation or selling of foreign lace. The royal family was exempt from this prohibition. It also seems to have been ignored by members of the court and other fashionable people, since Venetian needle lace continued to be freely sold and worn in London.